Chief United States District Judge M. Christina Armijo hosted 14 students and 3 faculty from the Law and Indigenous Peoples Program on a tour of the Pete V. Domenici U.S. Courthouse in downtown Albuquerque on March 3, 2015. The tour not only demonstrated the chief judge’s graciousness, but it also showed the strong ties the Law School has to the Bench and Bar and the dedicated support the New Mexico legal community extends to law school students. The tour was coordinated by Professor Creel (l), Valerie Vigil, and Naomi Julia Barnes (r) of the New Mexico Chapter of the Federal Bar Association. 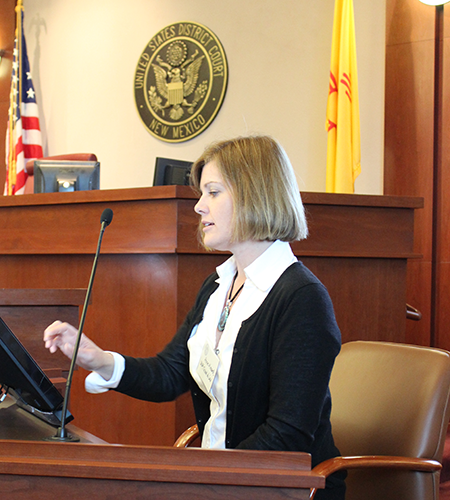 Professor Barbara Creel and the New Mexico Chapter of the Federal Bar Association collaborated on the tour as a way to bring the students into the daily life of the federal court. Valerie Vigil, law clerk to Judge Judith C. Herrera, coordinated the tour on behalf of the federal court and the chief judge. 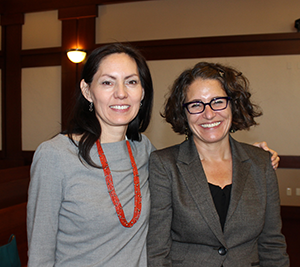 “I am grateful to Naomi Barnes and Valerie Vigil and the New Mexico Federal Bar Association for ideas and efforts in making this collaborative event possible,” said Creel. After Chief Judge Armijo welcomed the students in a reception area, the UNM Law group was invited to observe live proceedings in two courtrooms. Named after rivers in New Mexico, the courtrooms offer a grand and intimidating setting. The air felt dense and heavy in both courtrooms with the seriousness of the crimes – a bank robbery by a person with a history of drug abuse and a domestic altercation that ended up wounding a police officer – and with the sentencing, how lives were changing. The group listened to a defense attorney’s closing argument, a defendant’s answers to the judge’s questions, and the judges’ sentences in both cases. The group was also treated to a demonstration of the courtroom’s state-of-the-art audio-visual equipment by Adam Bustos. They learned the value of preparing beforehand to learn the technology to use it to its best advantage in the courtroom. The Pete V. Domenici U.S. Courthouse is one of the few courthouses in the country to have state-of-the-art digital technology. Anne Minard (’15) experiments with the touch-screen technology on the courtroom monitor. After the technology demo, three judges shared their experiences on the bench. Chief Judge Armijo talked about the statistics of criminal cases in New Mexico, how metro and state courts differ from the federal court, what kinds of cases are heard in federal court. Judge Herrera spoke of her work on the Bench, and Judge Johnson shared his background and expertise in criminal cases. Luncheon in the chief judge’s courtroom allowed students to meet with federal attorneys and judges individually and in small groups. During lunch, UNM law students enjoyed mingling with judges, including Judge Robert H. Jacobvitz (second from left). Chief Judge Karen Molzen (center) speaks with students at lunch. 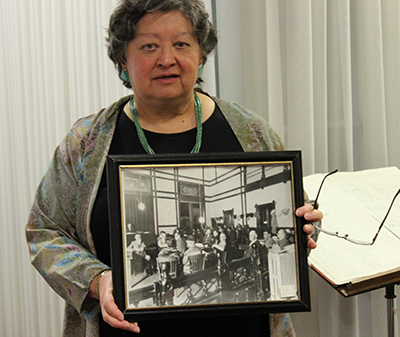 Chief Judge Armijo holds a photo of the final dramatic moments in a 1926 trial. The last stop on the tour was a visit to the chief judge’s chambers on the seventh floor. Chief Judge Armijo held a photo taken just minutes after her grandfather, Judge Luis E. Armijo, acquitted Carl C. Magee of manslaughter. Magee was a well-known newspaper man and lawyer who later went on to invent the parking meter. From observing courtroom proceedings to one-on-one meetings with nine members of the federal bench to stories in the chief judge’s chambers, the morning at the Pete V. Domenici Courtroom allowed UNM law students to see the federal bench in action.